Dealing with Plantar Fasciitis can be difficult, to say the least! There are numerous options you can try including stretching exercises, anti-inflammatories, supportive shoes, specialized socks, foot splints and arch supports. In our experience, each of these options can help when dealing with a pesky case of Plantar Fasciitis. One of the best options we find is using a good arch support so the foot stays supported throughout your day. Finding the best arch supports may be a difficult challenge since you have to take into consideration the shoes in which the arch support will be worn in and your foot type. Before you purchase any pair of arch supports for Plantar Fasciitis, (we recommend visiting any of our stores for a free foot analysis.) We can help you find the best arch supports based on your foot type, gait (the way you walk) and most importantly your shoes! How do I choose the best arch support? So many times we hear that an arch support DID NOT work for someone. What that usually means is the type of arch support was not the correct type for the individual’s foot type and more importantly, shoe type. Which means, the type of shoe you are putting the arch support is really the most important consideration to be made when choosing an orthotic. We will provide a few points you should be looking for when selecting the best arch supports for Plantar Fasciitis. The best arch supports for Plantar Fasciitis will effectively help support your arches and evenly distribute pressure across your whole foot (refer to image #1). In addition, the best arch supports for Plantar Fasciitis will offer enough support to keep your feet from flattening out and help limit pronation. Most importantly, the best arch supports will actually fit into the shoes you are wearing so you can actually get used from them! Below are some of the best arch supports we recommend for Plantar Fasciitis based on the type of shoes you will be wearing them in. Why are Superfeet some of the best arch supports for Plantar Fasciitis? Superfeet arch supports are widely known for their heavy duty and legendary support which have helped thousands of people change the way their shoes feel and perform. It offers a vast selection of arch supports, but today we will discuss their Green and Blue models. 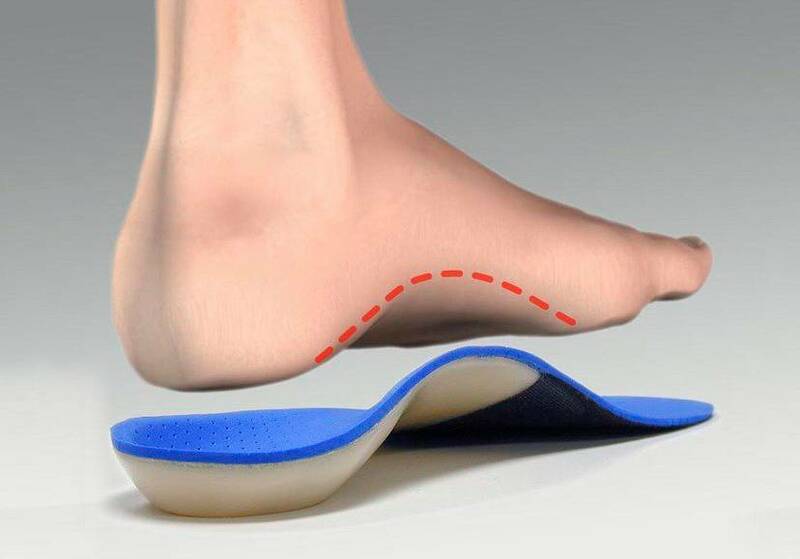 Although they have distinct features, both are high-density closed-cell foam insoles that can support and cushion your foot. Both Superfeet insoles have stabilizer heel cups. These stabilizer heel cups can help keep your heel in place and help reduce heel movement. This keeps the plantar fasciia from stretching as much which in turn, helps your foot heal! Why are Lynco’s some of the best arch supports for Plantar Fasciitis? Lynco’s are recognized as the #1 orthotic system on the market today and; are recommended by both medical professionals worldwide. As you look around and compare Lyncos, you’ll notice different arch supports for various foot types and gaits. While the memory foam is a great addition, it does make fitting more difficult. This arch support will only fit in shoes with thick removable insoles. Wider athletic shoes or shoes designed to accommodate orthotics will work best with this model. If memory foam is not what you are entirely looking for and would like a more customized arch support, Lynco also offers the L2400 series. The L2400 series orthotics are customizable and designed with removable gel plugs. Since our right and left foot are not mirror images, these L2400 arch supports allow you to modify for differences in your feet. Once you remove any necessary gel plugs for your custom fit, you’ll notice this L2400 arch support will help relieve pressure points and create a pressure free environment. This model is a little thinner than the memory foam L2200 model so it will be easier to fit into shoes with regular removable insoles. With all of the above models, none of these will work in shoes without removable insoles. Adding these full-length insoles on top of an existing insole will more than likely make the shoes too tight and fit incorrectly. Why are Lucky Feet Shoes branded orthotics some of the best arch supports for Plantar Fasciitis? Come into any of our and try on a pair of arch supports for plantar fasciitis! 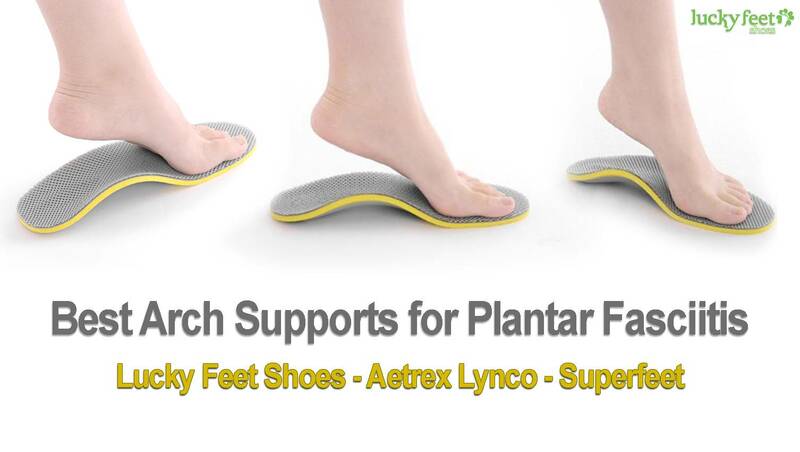 At Lucky Feet Shoes, we carry many arch supports, shoe insoles and offer custom orthotics. If you are looking for arch supports in Orange County, the Inland Empire, Los Angeles County, Temecula or Riverside; we have nine stores to serve you! Come and visit us today! If you are looking for Arch Supports for Plantar Fasciitis in Anaheim, Anaheim Hills, Yorba Linda, Brea, Orange, Placentia, Costa Mesa, Santa Ana, Fullerton, Irvine, Villa Park or Tustin; visit our store in Anaheim Hills and Costa Mesa. If you are looking for Arch Supports for Plantar Fasciitis in San Dimas, Glendora, Pomona, Covina, West Covina, La Verne, Azusa, Diamond Bar or Claremont; visit our store in San Dimas and Long Beach. If you are looking for Arch Supports for Plantar Fasciitis in Rancho Cucamonga, Ontario, Upland, Fontana, Rialto, Chino, Chino Hills, Mira Loma, Eastvale, Colton or San Bernardino; visit our store in Rancho Cucamonga. If you are looking for Arch Supports for Plantar Fasciitis in Riverside, Moreno Valley, Corona, Rubidoux, Loma Linda, Grand Terrace, Redlands or Norco; visit our store in Riverside. If you are looking for Arch Supports for Plantar Fasciitis in the Temecula Valley, Murrieta, Fallbrook, Lake Elsinore, Wildomar, Hemet, San Jacinto, Pala, Sun City, Menifee, Canyon Lake, Perris, Bonsall or Anza; visit our store in Temecula. If you are looking for Arch Supports for Plantar Fasciitis in Indio, Coachella, Thermal, Vista Santa Rosa, Valerie; visit our store in La Quinta. If you are looking for Arch Supports for Plantar Fasciitis in Cathedral City, Thousand Palms, Palm Desert, Palm Springs, Desert Springs, Rancho Mirage or Bermuda Dunes; visit our store in Palm Desert.